The potassium (K) content of harvested forage has become an increasingly important issue in recent years. As most dairy producers already know, a high level of K in forages has been identified as the causative factor for milk fever in dry and transition cow diets. Increasingly, buyers and sellers of hay now base purchase decisions on forage tissue K content. Dairy producers are seeking strategies to lower the K content of harvested forage. This trend has caused some to consider practices and expenses not justified based on our knowledge of forage growth and factors affecting K composition. When are high K diets most detrimental to dairy cattle? Hypocalcemia results from a deficiency in plasma calcium at the onset of lactation in dairy cows and is the main cause of several sever metabolic disorders. Three weeks prior to calving, it is recommended to have a moderately anionic diet to avoid milk fever and hypocalcemia. It is during this period that low K forages are desirable. Immediately after calving, a cationic diet is essential. Milking dairy cattle can tolerate forage that has a high K concentration during lactation because they can void the excess K in the milk. How to forage species differ in terms of K concentrations? All forage, except corn silage, grown on the same ground contain similar K levels at the same stage of maturity. 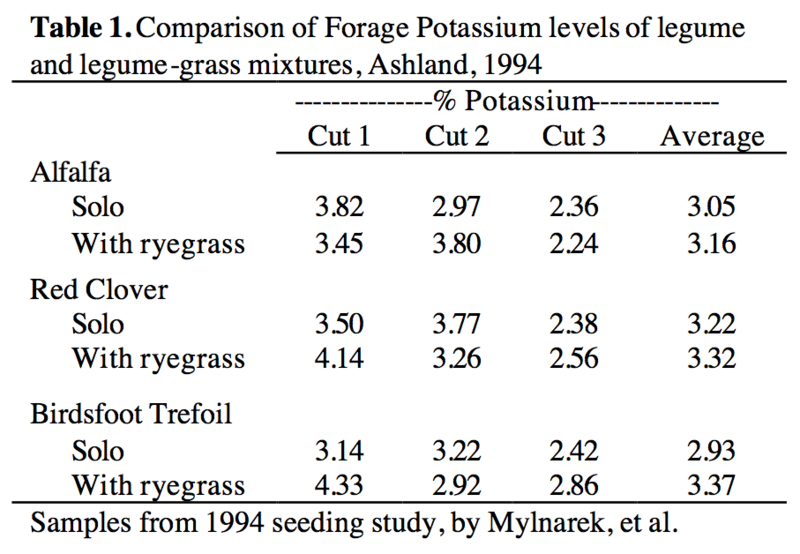 As the data in table 1 indicates, seeding ryegrass with alfalfa did not affect the K concentration of the harvested forage. National databases of forage composition, su ch as those in the National Research Council requirements for dairy and beef animals, list lower K concentrations for some grasses than legumes. This simply means that grasses, on the average, are grown on lower K soils. In fact, grasses tend to be more efficient than legumes in their ability to extract K from the soil. For this reason, grasses will often be at or above tissue K level. Adding a grass to your forage establishment mix will usually not result in lower tissue K levels of the harvested forage. What are some strategies for harvesting forage with reduced K concentrations? It’s well documented that alfalfa will take-up K beyond its needs if high levels of soil or applied K are available. This is referred to as “luxury consumption” and is demonstrated in figure 1 (Kelling and Speth, 1998). Typically, alfalfa yields plateau at about 120 to 140 ppm soil test K. At this level, approximately 200 lbs. of K2O need to be applied annually as topdress to optimize yield and to maintain soil test levels. 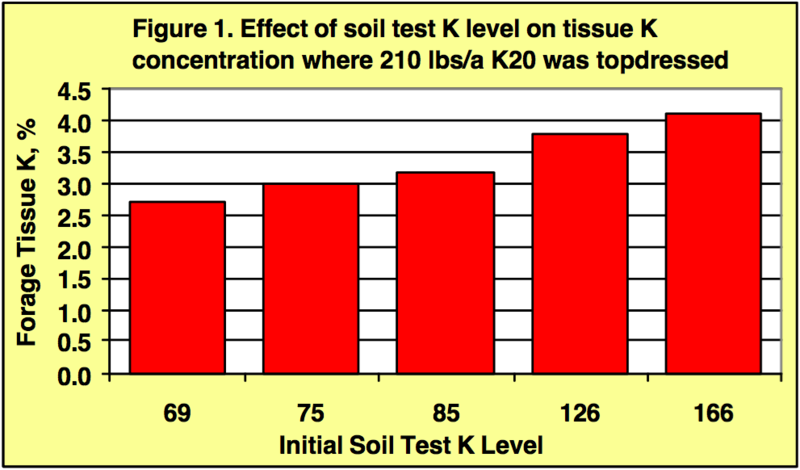 Little to no yield response to topdress K is experienced when soil test K exceeds 150 ppm. Potassium tends to be concentrated more in the stems than the leaves and is even more concentrated in the upper stems (Romancer et. al, 1975). Therefore, cutting low to include as much stem as possible will cause the resulting forage to be lower in K as shown in the figure below. As legumes and grasses mature, their K content declines. Alfalfa was found to decline from 2.75% to nearly 1.75% K from late vegetative to one-fourth bloom (Baker and Reid, 1977). Similar work at the UW Marshfield Research Station showed that from late vegetative to full bloom, K levels in alfalfa dropped from 3.21 to 2.08%. At the same site, bromegrass from second node to late heading dropped from 3.01 to 2.41% K. Grasses at flowering may have half the K concentration of immature forage earlier in the season. Potassium is not a part of any plant compound. It is in the cell solubles and therefore very readily leached from the plant when rain falls between mowing and harvest. In Wisconsin during 2001, 0.6 inches of rain reduced tissue K from 2.55 to 1.90% K.
What if all of my fields test high for K? Select a small acreage which will not have manure applied to it. This can often be some distance from the barn to reduce overall hauling to remaining fields. Plant a long-lived grass, such as smooth bromegrass or reed canarygrass. Avoid all forms of K fertilization (No Manure). Grow for two years with no fertilization other than nitrogen to draw down the soil K.
Harvest 2 times per year, first cutting at boot or early heading stage (early to mid June) and mid-September. Use grass regrowth for cows close to calving, as it should be lowest in K content. Quality will be adequate for dry cows, not for milking cows. How do I test forage for K? Although NIR is a useful analysis tool, the University of Wisconsin recommends wet chemistry mineral analysis for balancing feed rations. Do not buy, sell, or feed forage based solely on an NIR analysis for K concentration. If this is important, spend the extra money to have the determination done with wet chemistry techniques. Use results from NIR testing only as a guide to identify very high or very low testing K forages. Baker, B.S. and R.L. Reid. 1977. Mineral concentration of forage species grown in central West Virginia on various soil series. West Virginia University Agric and Forestry exp. Stn. Bull 657. Kelling, K.A. and P.E. Speth. 1998. Alfalfa response to K rate, source and time of application. Proc. NC Extension-Industry Soil Fertility Conf., St. Louis, MO. Vol. 14:110-118. Rominger, R.S.D. Smith, and L.A. Peterson. 1975. Yields and elemental composition of alfalfa plant parts in late bud under two fertility levels. Can J. Plant Sci. 55: 69-75. Wiersma, D.W. and J.B. Peters, 2000. 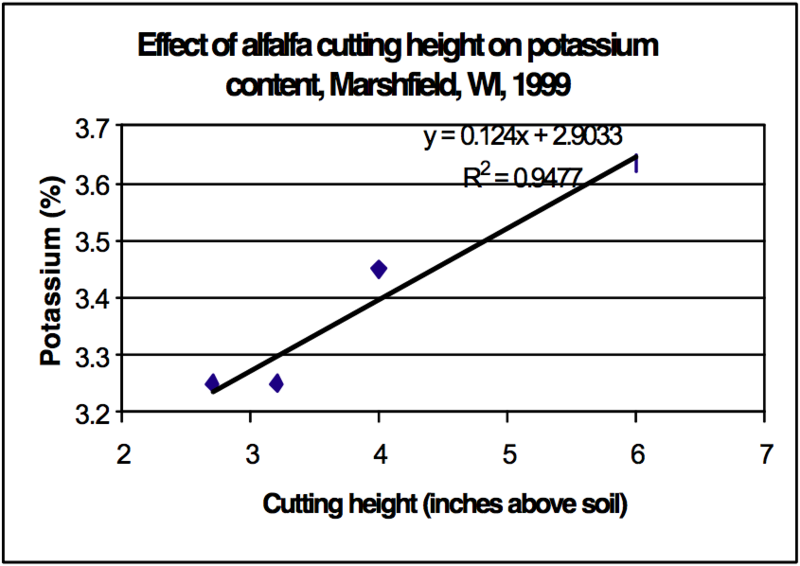 Effect of cutting height on alfalfa yield and tissue K levels. Proceedings of Wisconsin Fertilizer, Aglime, and Pest Management Conference. Vol 39:381-386. Mike Rankin, Crops and Soils Agent, Fond du Lac Co.